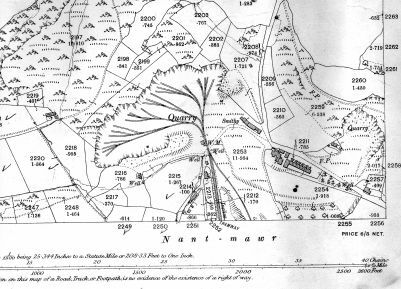 Nantmawr Quarry lay within the lands of the Earl of Powys and prior to 1862 was leased to Samuel Morton and Morgan Jones. When they surrendered possession at the end of that year the new lease was negotiated with R.S.France esq of the Shrewsbury and North Wales Railway Co. (Potts Line) On Tuesday 20th February 1872, experiments were carried out in Nantmawr Quarry to test the effects of "Lithofracteur" (Dynamite). A large amount of national and local dignatories, including Thomas Savin and Mr R.S.France (Lessee of the Quarry) were in attendance. 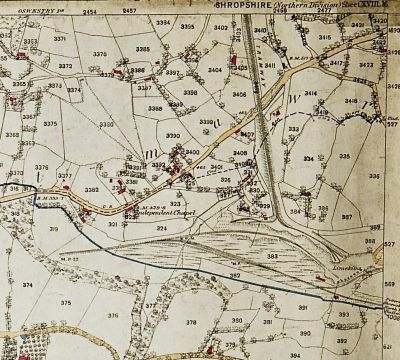 By 1870 France had demolished the old malthouse and other buildings there and had invested heavily(£20,000) in new workings, kilns, a tramway system and cottages for his workmen At the same time France negotiated a lease to extend the Llanymynech - Nantmawr branch of the 'Potts' line to service the quarry. He later sold the lease of the quarry to J.Parson Smith. 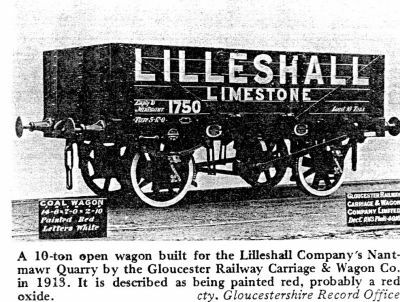 At the beginning of the 20th century the Lilleshall Co, formed in 1802, had two limestone quarries and works, one at Presthope, near Much Wenlock and the other at Nantmawr purchased from Parson Smith in 1899. By then there was an extensive system of tramways leading down from the rock face to the railway line with five large 'running kilns' and a smithy. Besides burning lime, the company sold limestone for blast furnace flux in steel works. 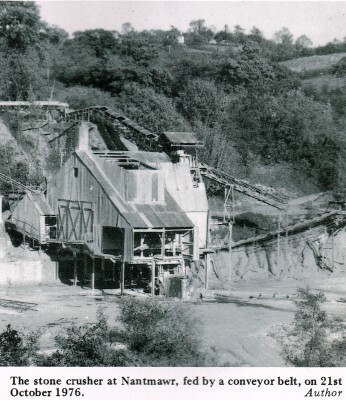 Operations continued there for about 20 years and after a period of closure the quarry was re-opened and used by Amey Roadstone until it closed finally in 1977. Document dated Tuesday 20th February 1872 detailing experiments carried out in Nantmawr Quarry of the effects of "Lithofracteur" (Dynamite) which was being intrduced into Great Britain from Germany. 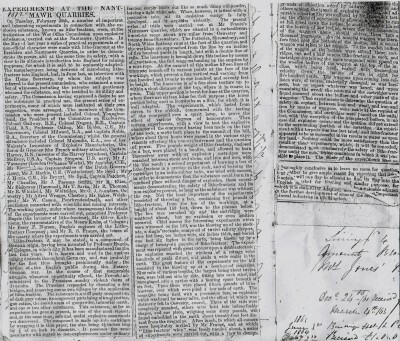 A huge amount of national and local dignatories including Thomas Savinand Mr R.S.France (Lessee of Nantmawr Quarry) were all in attendance to see the various experiments of this explosive substance. 1901 map showing the tramlines in the quarry bowl. 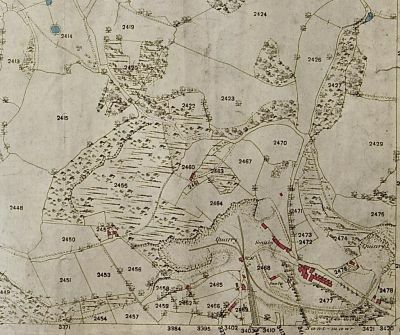 1875 map showing the tramline leading from Nantmawr quarry down to the bank of lime kilns adjacent to the main railway line. 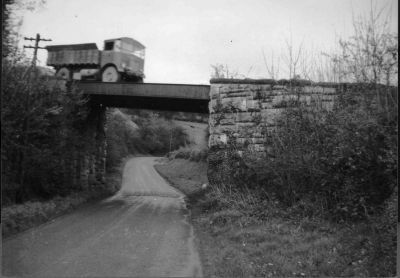 Old photo of a tipper lorry driving down the tramline towards the limekilns. 1913 photo of a 10ton open wagon built by the Gloucester Railway Carriage & Wagon Co. It is described as being painted red, probably a red oxide, with the "Lilleshall" in 12" high letters. Photo taken 21st October 1976 of the stone crusher above the limekilns at Nantmawr. 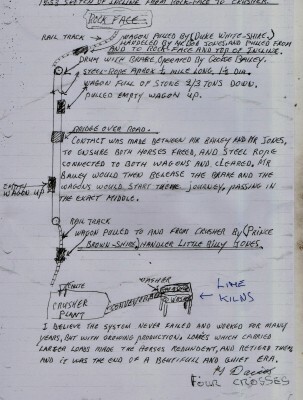 Source Tanat Valley Light Railway by Mike Lloyd.